Thanks for enrolling in the Virtual CRASH self-paced training course. Below you’ll find more helpful information about your course. Please allocate enough time to complete the course. Your access to the course will expire one month after enrollment. Your enrollment expires on the date indicated above. Your final grade will either be a “Pass” or a “Fail”. Grading is based on your performance on quizzes and projects. You’ll need a score of 70% or higher to receive a “Pass” for each of the given quizzes and projects. You must pass all quizzes and projects to receive a “Pass” for the course module. If you pass a training course module, you will receive a certificate of completion indicating you have passed that module. We will not keep permanent records of your specific quiz or project performance. If you pass a training course module, our permanent records will only indicate that you have successfully passed that given module. You will be automatically enrolled in your selected course. Be on the lookout for an email from notifications@instructure.com. Once you receive the email, press “Get Started”. This will take you to the Canvas webpage. Next, press “Create My Account”. Next, you’ll need to make a login name and password for your account. Be sure to write these down somewhere because you’ll need to use these to log in next time. Finally, agree to the terms of service and press “Register”. Once you’ve competed the login procedure, you’ll be taken to the course homepage. Left-click on the “Dashboard” icon in the left column to see all of your courses. We recommend first left-clicking on “Welcome | Start Here” to learn more about the self-paced training courses, grading policies, quizzes, and projects. Once you’ve entered a course, left-click on “Home” to see all the course’s contents. Left-click on the course introduction to begin viewing the course content. 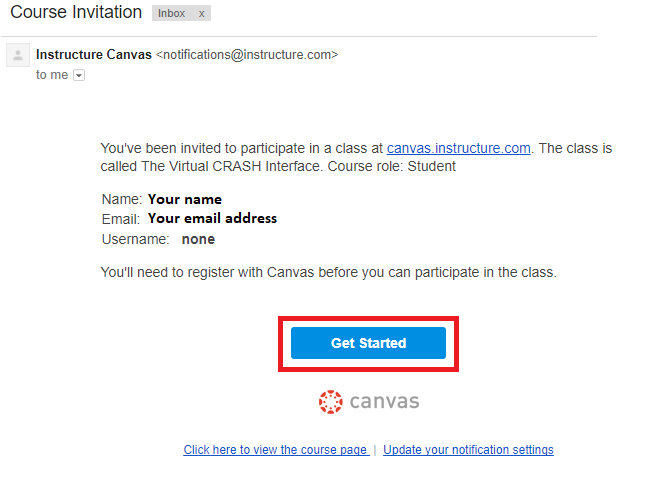 You can send messages to the instructor within Canvas by left-clicking on the Inbox icon in the left column. Select your course from the Course dropdown menu. Then in the To field, select or type “VCRASH Instructor”. We wish you luck! You are ready to begin.